Director Kim Sung-hoon attempts to combine genre thrills with a political allegory. The actor-director team behind last year's hit spy action-comedy Confidential Assignment returns with their latest tentpole Rampant, an action-horror that looks to put a period twist on Yeon Sang-ho's runaway 2016 zombie hit Train to Busan. Hyun Bin versus the undead in Joseon Era-regalia may sound like an intriguing proposition, but while this big-budget foray from director Kim Sung-hoon attempts to combine genre thrills with a political allegory, it winds up being both a bloodless zombie tale and a humdrum King's court drama. A rebellion is brewing in the Joseon Kingdom against the King (Kim Eui-sung) and his war minister Kim Ja-joon (Jang Dong-gun). 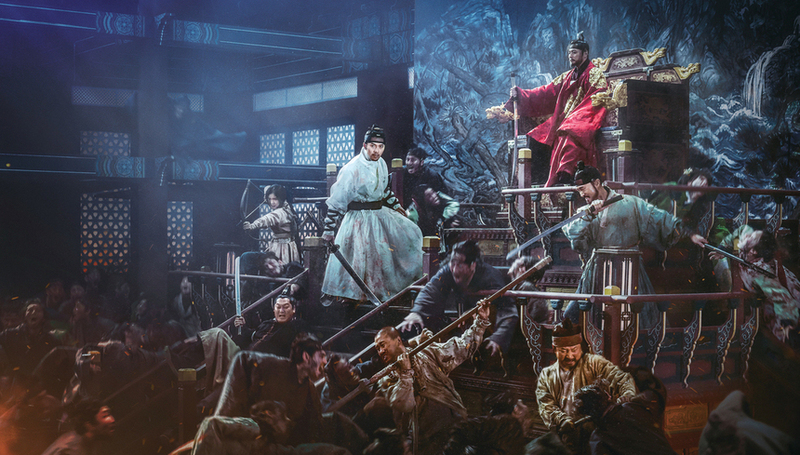 The Crown Prince (Kim Tae-woo), siding with the rebels, summons his brother Ganglim (Hyun Bin), who has been exiled in the Qing Empire for a decade. Ganglim returns, but rather than a welcome committee, he is met with an empty port town during the day, which becomes overrun with 'night demons' after sunset. When Ganglim meets the warriors of the rebellion, together they must fight a path back to the palace to face the villainous minister Ja-joon, who seeks to use the night demon crisis to his advantage. The Joseon Era period drama has been a box office draw for several years in Korea, but of late, the genre has become increasingly rigid, as each new entry puts its own allegorical spin on the political corruption that has wracked recent Korean administrations. This has occasionally led to triumphs such as Hwang Dong-hyuk's brooding siege drama The Fortress, but more often than not, the results are clunky and repetitive. There's only so many ways to film scheming ministers consulting arrogant kings in their throne rooms, no matter how nice your sets and costumes are. In fact, the basic plotline of Rampant will seem especially familiar to anyone who watched the period creature feature Monstrum, out in theaters just a month earlier, which also sees a minister plot to overthrow a king, and later use the public fear of a monstrous creature that threatens the kingdom to his advantage. Monstrum wasn't a terribly exciting film, but it was less serious, better paced and shorter, and thus far more successful. Rampant does the political scheming just as well as any other big-budget Korean period fodder, but what it lacks is a sense of fun and an ability to integrate horror into its familiar political tale. As a zombie film, this period action chiller lacks scares and ideas, but most of all it demonstrates little understanding of the horror codes it attempts to assimilate. Watching Train to Busan it's fairly clear that the man behind it is a horror fan, but this does not appear to be the case with Rampant. Kim Sung-hoon tries to wriggle around genre conventions by calling his zombies 'night demons', but having his walking dead unable to go out in the light (where they burn up like vampires) amounts to a misunderstanding of what makes them work. Things only get worse when a different kind of zombie emerges in the final act (forgive me for being vague), which flies in the face of the logic established in the film. The frenetic but listlessly shot set pieces only serve to cement the films' problems but even then this could almost have gotten away with it as mildly diverting fare had it ended after its first climax, which presents a natural ending point, rather than resetting the gears and plodding on for another 25 minutes of toothless and tedious zombie skirmishes. Between Monstrum, Rampant and the egregiously terrible The Wrath (out this month), Korean period horror's 'big year' has been horrific for all the wrong reasons. Here's hoping Netflix will get things back on track early next year, when they debut the period zombie action-thriller Kingdom, which bears many similarities with Rampant but boast stronger pedigree, including Tunnel star and director tag team Doona Bae and Kim Seong-hun (same name, different person).